Whale populations have plummeted, with scientists racing to better understand the threats that face these huge creatures. One difficulty is how to collect data from whales without placing them under undue stress through the use of invasive sampling techniques. As a result, Kerr and his team of researchers have been looking for a less invasive technique, one that allows for a better representation of whale health. Now, thanks to Artificial Intelligence and drones, it looks like they just might have found it. 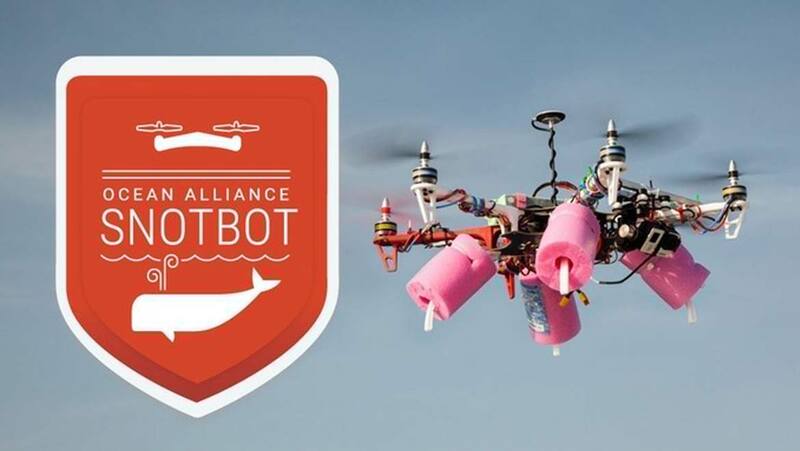 Ocean Alliance, a charitable organization focusing on whale and ocean conservation, has partnered with Parley for the Oceans and more recently, Intel to develop an innovative, non-invasive sampling technique using a specially adapted drone, known as SnotBot. With the clue in the name – this drone collects the blow, or Exhaled Breath Condensate (EBC) exhaled from whales as they come to the surface to breathe. This blow, or snot, contains many clues to a whale’s health as it contains bacteria, DNA, viruses and toxins in addition to a variety of different hormones. The samples can then be flown back to a research vessel stationed a respectful distance away from the whales. After a number of successful missions to prove the drone’s effectiveness as a sampling tool, Intel were brought on board. Their involvement centers on their expertise in connected technology. This means that data from the SnotBot can be downloaded and run through an algorithm in order to assess the health of the whale in real-time. Artificial Intelligence means that this can be completed even with limited visibility, rough seas and the unpredictability of sampling from live animals. The SnotBot is now based on a Falcon 8+ Intel drone, designed for rugged environments where precision flying is essential. Adaptations include waterproofing and connections to allow petri dishes and sterile sponges to be attached in order to collect samples. Once collected, the samples are then analyzed for levels of a variety of hormones, including the stress hormone glucocorticoid, reproductive hormones testosterone, progesterone and estrogen, as well as the metabolic hormones triiodothyronine and thyroxin. By monitoring levels of stress hormones in whales, we can start to build a clearer picture of how changes in the ocean may be affecting them, as well as discovering possible impacts that have not been considered before. Dr. Iain Kerr, CEO of Ocean Alliance, presented the SnotBot at World Oceans Day on June 8 2017. Kerr believes that the “future of humanity lies with the oceans” and as such, it’s vital that we aim to understand more about whales, the ocean’s biggest inhabitants. SnotBot has now completed successful missions in Patagonia, to study the Southern Right Whale, to the Sea of Cortez focusing on Sperm Whales and lastly to Alaska where Humpback Whales were found. Thanks to the fact that the drones are also fitted with cameras, the team were able to collect some truly awe-inspiring photographic and video footage as well as their biological samples. Whilst also finding out more about each individual whale, we can also discover more about the ocean itself. Kerr thinks that it will be possible to operate the drones from land at certain locations, thus reducing the cost of an expedition because no boat is required. Additionally, he envisions a future where this technology can form a sort of citizen science, with individual drone owners also able to collaborate with scientists by collecting data themselves.